A clot in the retinal vein can lead to severe and irreversible loss of vision. In a report in The American Journal of Pathology investigators utilize a newly developed model of central retinal vein occlusion (CRVO) in mice that mimics many of the clinical features of CRVO in humans to study the pathologic effects of retinal occlusion and demonstrate the retinoprotective effects of the peptide adrenomedullin (ADM) and its receptor activity-modifying protein RAMP2. “CRVO is the second most common retinal vascular disease next to diabetic retinopathy. In recent years, intravitreal administration of anti-vascular endothelial growth factor (VEGF) agents has been used to treat CRVO by suppressing retinal vascular permeability. However, recurrence of macular swelling and decreasing drug effectiveness are limitations of this approach. Therefore, identification of other therapeutic agents that enhance vascular integrity is desirable. 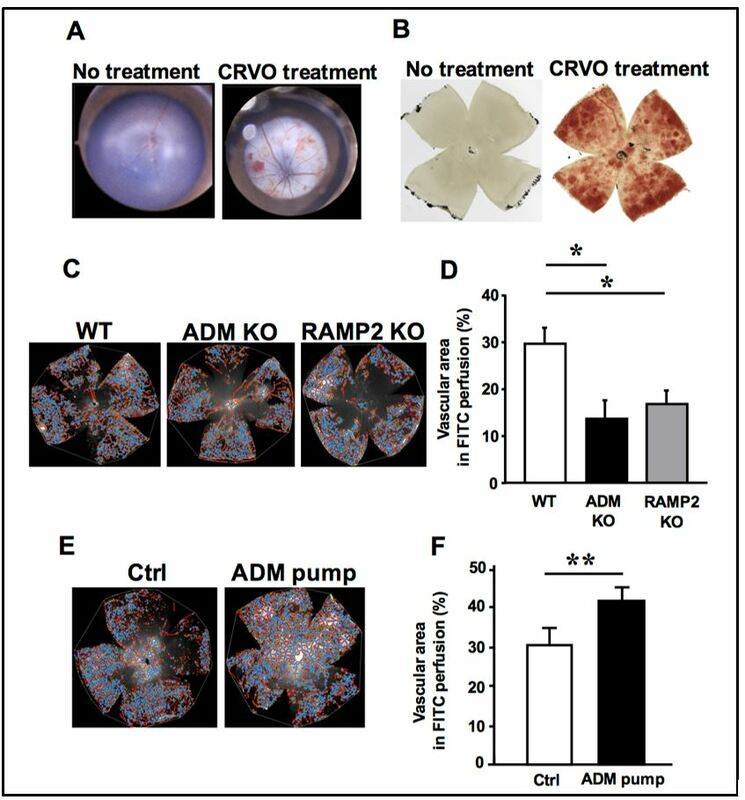 In this study, we proved that the ADM-RAMP2 system is one of the novel therapeutic targets for treatment of CRVO,” explained Takayuki Shindo, MD, PhD, of the Department of Cardiovascular Research at Shinshu University Graduate School of Medicine, Matsumoto, Japan. A: Topical endoscopy fundus imaging showing the ocular fundus of untreated and central retinal vein occlusion (CRVO)-treated mice (day 7). In the CRVO-treated mice, note the retinal hemorrhage and venous dilatation with tortuousness resembling clinical CRVO. B: Retinal flat-mount images of untreated and CRVO-treated mice (day 7). In the CRVO-treated mice, retinal hemorrhage is prominent. C: Fluorescein isothiocyanate(FITC)-perfused retinal flat-mount images analyzed using AngioTool software in wild-type (WT), Adm knockout (ADM KO), and Ramp2 knockout (RAMP2 KO) mice after CRVO treatment (day 7). Blood vessels are depicted in red, and vascular branch points are depicted in blue. D: Percent vascular area in FITC-perfused retinal flat-mounts quantified using AngioTool. E: FITC-perfused retinal flat-mounts analyzed using AngioTool software in control (Ctrl) and ADM-administered (ADM pump) mice after CRVO treatment (day 7). Blood vessels are depicted in red, and vascular branch points are depicted in blue. F: Percent vascular area in FITC-perfused retinal flat-mounts quantified using AngioTool. “As the biological functions of ADM are likely different from VEGF antibodies, co-administration of ADM and VEGF antibodies may be a choice in some diseases. It may also be used as secondary therapy when patients become resistant to VEGF antibodies,” commented Dr. Shindo. The article is “Development of a Novel Model of Central Retinal Vascular Occlusion and the Therapeutic Potential of the Adrenomedullin–Receptor Activity–Modifying Protein 2 System,” by Kazutaka Hirabayashi, Masaaki Tanaka, Akira Imai, Yuichi Toriyama, Yasuhiro Iesato, Takayuki Sakurai, Akiko Kamiyoshi, Yuka Ichikawa-Shindo, Hisaka Kawate, Megumu Tanaka, Kun Dai, Nanqi Cui, Yangxuan Wei, Keisei Nakamura, Shiho Iida, Shuhei Matsui, Akihiro Yamauchi, Toshinori Murata, and Takayuki Shindo (https://doi.org/10.1016/j.ajpath.2018.10.021). It will appear in The American Journal of Pathology, volume 189, Issue 2 (February 2019) published by Elsevier. This study was funded by Core Research for Evolutionary Science and Technology (CREST) of Japan Science and Technology Agency (JST) and the Japan Agency for Medical Research and Development (AMED). Contact Eileen Leahy at +1 732 238 3628 or ajpmedia@elsevier.com to request the full text or arrange an interview with the authors.